Highs and Lows of Birding: The Asian Duck and the local duck pond!! 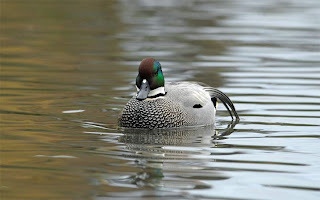 In recent weeks a cracking male Falcated Duck has taken up residence on a small local duck pond popular with local families that like to feed bread to the ducks. In late Dec 2006 and early 2007 a drake Falcated Duck was seen at nearby Cliffe/Higham and briefly at Swanscombe further west. As the duck flies, these sites are very near to Southfleet duck pond or Broadditch as it's known being opposite the farm shop of that name. The bird is fully winged, un ringed though very tame alike the Mallard and other 'ducks' it associaites with. Where it came from no one really knows though apparently it first appeared late in 2007 and seems happy with it's new home. 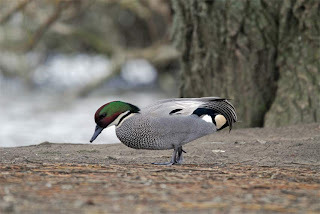 Falcated Duck has yet to be officially added to the Britsih list of Birds recorded and the problem of escapes especially with ducks will always exist. Whatever it's origins a cracking bird to see so close to home and is really photogenic.